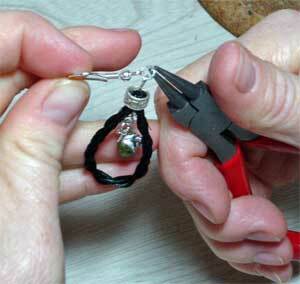 If you missed the Horse Hair Jewelry Class last Sunday, you have another chance! Swine flu claimed some of class, so I rescheduled another class for Thursday, November 19 from 2:30 p.m. to 5 p.m. The class will be at My Father’s Beads in Coopersburg, PA. You can register online or call the store at 610-282-6939. Time to make start making gifts for Christmas! I am so excited to announce that I will be running the Horse Hair Earrings Jewelry-Making Class at My Father’s Beads inn Coopersburg, PA! 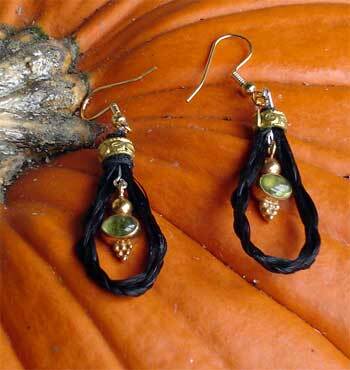 Join me on November 1, 2009, from 1:30 to 4:30 as we create a stunning pair of earrings using horse hair, plus beads and baubles from My Father’s Beads. The class costs just $38 plus supplies and you can choose from a variety of earwires, beads, cones and charms to include in the earrings. To signup, go to My Father’s Beads Website or call the store at 610-282-6939. I can’t wait to see what everyone comes up with. With a whole store full of beads to choose from, every pair of earrings will be completely different. This time, I have to take pictures. (I forgot last time). Also coming up this weekend…I’ll be demosntrating quillwork at Wildlands Conservancy as part of Emmaus, Pennsylvania’s 250th anniversary celebration. Stop on by and say hi! Learn how to make a 4 strand braid, then finish off the bracelet with a variety of beads at the upcoming horse hair jewelry class. Don’t miss the upcoming horse hair bracelet class! 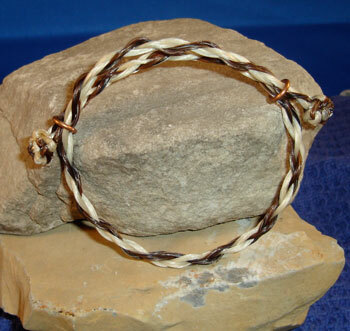 I will be teaching a horse hair bracelet class on Sunday, August 2, 2009, from 10:30 a.m. to 12:30 p.m. Come join me as you learn how to create “pulls” of horse tail by spinning the individual hairs together. Then we’ll use 4 pulls to create a 4-strand braid. Each braid will be transformed into a unique ornament as you pick from a variety of beads to create your own adjustable horse hair bracelet. Pre-registration is required so sign up now. More information and a registration form are available as a PDF here. Horse hair bracelet with glass seed beads picked by the customer. Has it really been almost a month since I last posted? Wow! A lot has happened since then! School ended and we’ve been attacking summer vacation with gusto. The week we spent on an island on Lake Champlain felt like a month. It was wonderful! How lucky we are to have friends willing to share their experiences with us as we help them build a home away from home in such a beautiful location! Between the playdates and swimming and generally reveling in the summer-ness, I haven’t gotten much work done. But finally the kids were off with the grandparents and I cranked out some new jewelry yesterday. First, a lovely custom horse hair bracelet with multicolor beads. 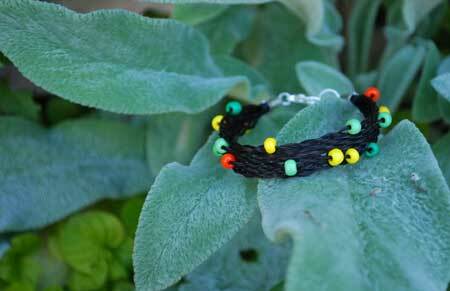 She picked out her daughter’s favorite colors of the moment to be braided into the bracelet. 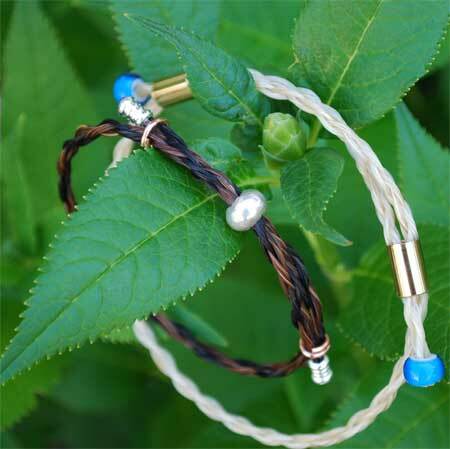 most of the horse hair bracelets I offer can be embellished with beads. Learn how to make a 4-strand braid, then finish off the bracelet with a variety of beads at the upcoming horse hair jewelry class. 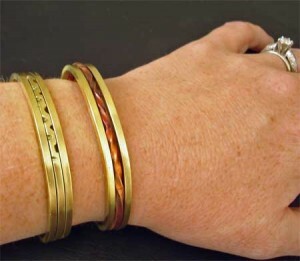 Next on the list were two adjustable bracelets. These are samples for an upcoming Horse Hair Jewelry Class on August 2, 2009 at the Museum of Indian Culture. Sign up soon if you want to join the class! The quietness yesterday allowed new thoughts (oh my!) to float about in my head. At least 10 new ideas are making their way into my idea book. I’d love to sit by myself and create for a week, but the reality is, I have more summer to enjoy with my husband and two kids. So instead, kick back with an adult smoothie, the recipe I promised you last blog post. Put the fruit you strained from the fruit cordials into a blender with some sparkling water or white wine or both. Puree. Peach makes a very sweet adult smoothie; blueberry makes a very alcohol-laden smoothie. I know I’ll be enjoying one later! Sunday’s Porcupine Quillwork Classes went off without a hitch. 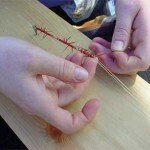 We had a small class, which let everyone ask lots of questions and really get a feel for quillwork. We even had visitors. 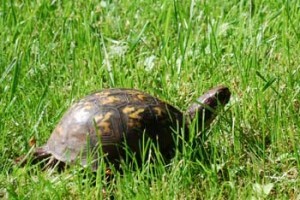 A box turtle moseyed by before class started. During class a pair of red-tailed hawks screamed overhead. We have the class outside in the pavilion where we can enjoy some fresh air, see the equestrians and runners out for some exercise on the path and log some nature time. Surprise guest: A female box turtle, ready to lay her eggs, wandered through class. The participants had such a great time that they asked for a horse hair bracelet class next! Details are still sketchy, but right now, I’m looking at July 26, August 2 or August 30 for the class. I know some of you out there are interested in this class, so please e-mail me with the date(s) that works best for you. All supplies for classes are provided, but if you have a horse, you are welcome to bring your own horse hair. I’ll give you instructions for cleaning it in advance of the class. June 7, 2009 10 a.m. to 12:30 p.m.
June 7, 2009 1 p.m. – 3:30 p.m.
Download this pdf for more information and the registration form. 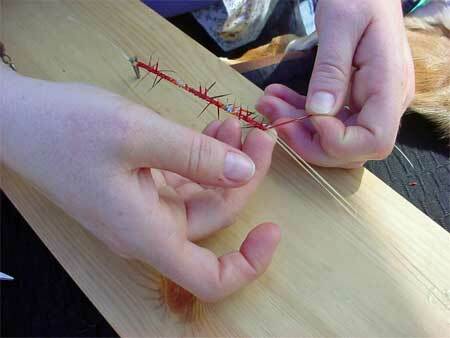 Plaiting porcupine quills. All the prickly ends get sniped off when the braiding is done. The Museum of Indian Culture will be hosting me on June 7, 2009, to teach two Porcupine Quillwork classes. You can join me for one class, although you get a 15% discount if you attend both classes, plus an additional discount if you’re a Museum member. You can become a member of the Museum of Indian Culture when you sign up for the classes. The pdf contains more information about pricing and how to sign up. If you have any questions, please feel free to contact me through e-mail or at 610-905-8399. 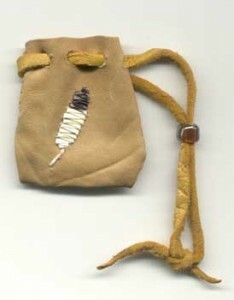 A feather quilled on a leather pouch using the zigzag stitch. This stitch is taught in the Porcupine Quillwork Part 2 Class. It’s been a while since I taught a quillwork class, but I just demonstrated at the Museum’s latest powwow. I meet a surprising number of people at the powwow who have an appreciation for porcupine quillwork, since this art is often overlooked in favor of beadwork. Porcupine quillwork pre-dates the beadwork we often associate with Native American Indians. 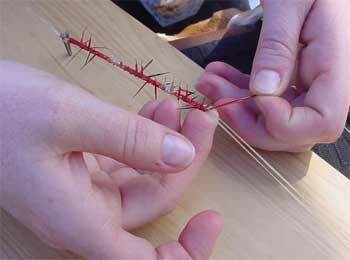 Using available resources, Native Peoples developed a technique for embroidering porcupine quills onto leather or wrapping quills around rawhide and sinew to make intricate patterns. This was the pre-1500s, when steel needles, cotton thread and glass beads weren’t yet developed in the Americas. Native women harvested the quills from porcupines, clean them and dyed them using local plants such as blueberries, sassafras and sunflowers. The women placed the quills (very carefully!) in their mouths to soften them to a pliable state, then pulled the quills through their teeth to flatten them. Flattened quills were embroidered onto brain-tanned leather using sinew (that’s tendon from deer, elk or buffalo). The quills were also wrapped around rawhide. Natives adept at this art could embellish nearly anything: war shirts and moccasins, pipes and tobacco bags, feathers and hair pieces. (Don’t worry: in our classes we use dishes of water and spoons to flatten quills and artificial sinew to sew the quills). 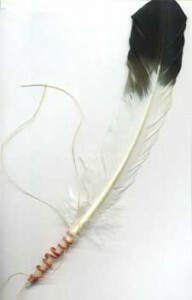 The porcupine quill plait, taught in Porcupine Quillwork Part 1, is wrapped around this feather. Not every tribe practiced this art. The Plains Indians are best know for their exquisite quillwork, but quillwork is also common among the Athabaskan and Metis peoples. Debate still goes on over whether eastern woodland peoples, like the Lenape, practiced quillwork since our humid eastern conditions would not allowed samples of this work to survive at archaeological sites. The Micmac people practice quillwork on birchbark, which is a different type of quillwork that is equally intricate, but a different set of skills than embroidery. (I don’t teach quillwork on birch bark). Come out and join us for a day of delving deep into history as you learn the dying art of Porcupine Quillwork. When you sign up for the class, you’ll also gain entry into the museum during our breaks. The Museum of Indian Culture just unveiled its beautiful new Plains Indian exhibit. Bring your lunch and make a day of the two classes. The August Powwow at the Museum of Indian Culture snuck up on me! It’s next weekend. Thoughts of quilling turtles and birds got me up the hills on my 4-mile run the other day. Hopefully I’ll have time this week to put those ideas down on leather. 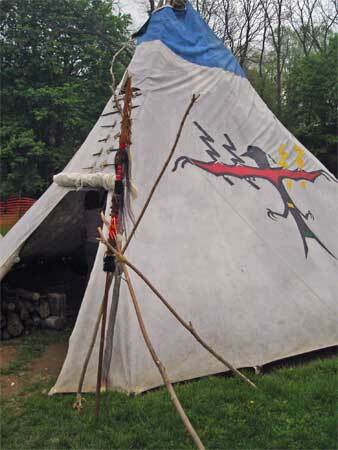 Visit the tipi in the LifeWays area. 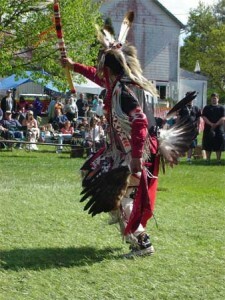 If you haven’t any plans for these beautiful days of summer, come on by and see Native American Indians show off their regalia and dancing skills. The Powwow runs from 10:30 a.m. until 6 p.m. on both Saturday and Sunday, August 16 and 17. Dancing doesn’t start until after opening ceremonies at noon. Then chow on a buffalo burger or Lakota taco. Yum! I’ll be in the LifeWays area, demonstrating porcupine quillwork and selling my quill and horse hair jewerly. If you’re thinking of getting horse hair jewelry made, come on by with your tail. I can show you the styles in person. 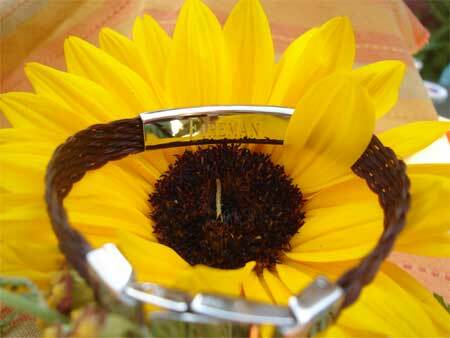 Speaking of horse hair, I have a new Horse Hair Bracelet class coming up at Out of Our Hands on September 21, 2008. The class will last from noon to 2:30 p.m. and you’ll walk away with a horse hair bracelet you created with your own hands. On September 20 I’ll be teaching Quillworking at the Museum of Indian Culture. Quillwork Part 1 will go from 3 p.m. to 5 p.m. and Quillworking Part 2 will be 5:30 p.m. to 8 p.m.
See the events page for more details. 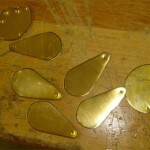 The beginnings of copper earrings. Yesterday I played with copper and brass, hammers and grinders, acid and fire. And look what I made! I had such a blast at my metalsmithing class and I can’t believe I get to do it again today! I’m so impressed that I made this jewelry. 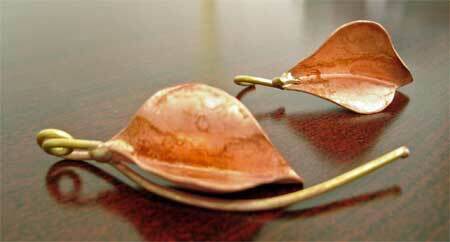 I can’t wait to work on these copper leaf earrings again today. The curlicue on top takes a lot of coaxing of the metal with the torch so you bend it without severing the rod. Ooops! That’s what happened to the other piece. But, I’ll bend the hook and make it into a pendant. I meant to do that, right? The torch had me a little leery, but after a few tries I’m fairly confident with it, and I have all my hair intact (although I did come close to melting someone’s sunglasses). The two cuffs were the first half of the day. Lots of filing, welding, buffing and bending. 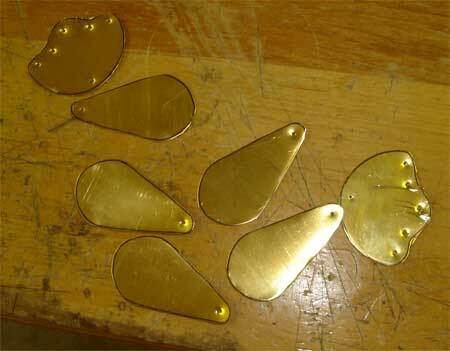 I also had a lot of grinding to do because, although I get along with the torch, I’m not adept at it, so I get huge blobs of brass instead of smooth joins. Necklace to be assembled today. 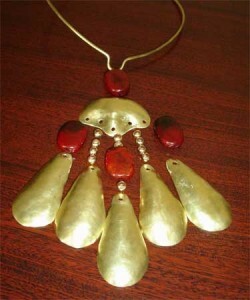 We moved on to the necklace in the afternoon and today I’ll assemble it. I wanted to add different beads so after class I ran over to The Bead Works in Lancaster. The 18 gauge wire limited my choices, so I settled on these darker red stones and some gold beads. I loved hammering out these shapes. 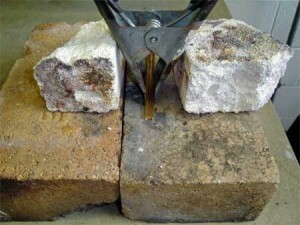 More than just banging with a hammer, shaping the copper is what I imagine bonsai tree trimming must be like…you just know where to apply the tool next. I could have hammered out shapes all day. Cooper and brass cuff ready to be welded. My hands are a little stiff from all the bending and hammering and cutting with sheet metal shears, but I’m read to head off to class again today. The instructor is awesome; he doesn’t take himself too seriously and he loves letting us fix our mistakes. Wish me luck that I can make a matching to that earring. Fireman's name engraved on the back. I sent this custom horse hair bracelet off a week or so ago. 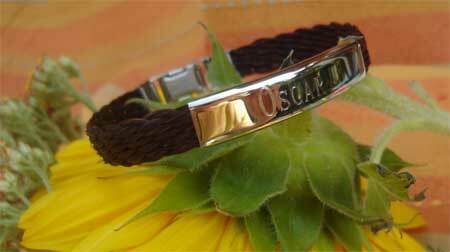 Oscar's name engraved on the front. Hopefully by now the owner of Fireman and Oscar has it in her hands or on her arm. Her friend had this bracelet made after she lost both of these horses in one short month. Her friend wanted a memorial of the two and asked me to make the bracelet with the stainless steel nameplated engraved front and back with the horses’ names. Both horses’ tails are woven into this bracelet. The barn where she kept the horses also creates memorial stones for lost horses. The stones and bracelet arrived within days of each other so both could be presented at the same time to the owner. They were presented together so we’ll “only have her cry once,” her friend said. Here’s to Oscar and Fireman. On a lighter note, I’m off to class this weekend to learn metalsmithing with Doug Salmon. The class is through the Pennsylvania Guild of Crafters, and I’m hoping to come away with not only $175 worth of handmade jewelry (that’s the promise from the class literature), but also some new applications for my horse hair jewelry. I already have ideas brewing and hopefully we’ll cover ringmaking because I’m anxious to develop a horse hair ring using silver to protect the horse hair. Someone suggested I could encase the horse hair in resin to prevent wear and tear of the horse tail. Obviously this was not a horse person, for he didn’t understand that horse people would actually want to touch the horse hair. I realized this is only the second art/crafting class I’ve ever taken. Sure I had art class in school and learned a variety of crafts in Girl Scouts and from my mom. But last year’s Precious Metal Clay class was the first time I ever paid an expert to teach me something. Interesting, considering how many different classes I’ve taught. I taught basic jewelry making at Michaels craft store, horse hair work at local stores and porcupine quillwork at the Indian Museum. All these crafts (and many others I’ve tried) were self taught, requiring lots of trial and error to get it right. That was back in the day when I had seemingly endless amounts of time. Now, it’s great to have an expert show me in 2 days what I could take years trying to learn on my own. So off I go to burn up some silver (they’re not letting us near gold…too expensive these days!) and brass and copper. I’ll let you know how it goes. 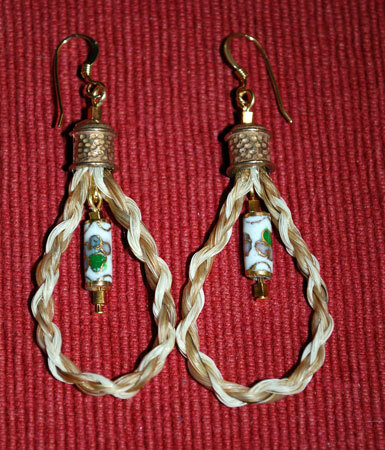 Out Of Our Hands is sponsoring a new class in July: Horse Hair Earrings! As you saw in a previous post, we had a great time learning how to make porcupine quill earrings. You get to see what goes into creating something by hand, plus you go home with a new piece of jewelry. Sunday, July 13 from noon to 2 p.m. Please contact me or Out of Our Hands at 610-965-4806 to register. While we’re on the subject of horse hair, click out the Horse Hair Jewelry tab along the top of the page. I finally added the horse hair earrings to the page so they are available for custom ordering. Also notice the changes in the product descriptions. Each product is named after a horse I’ve known during my life. In the future I hope to include photos of each of these horses, but given some of them are steeds I met 20-some years ago, I have to do some digging to do. Remember the days of film cameras? Push the button, advance the film BY HAND. Then wait ages, no eons for the film to get developed and sent back to you in the mail (the anticipation alone, made me stare down the mailbox for days). Then, the big question: are the photos good…no heads cut off or blurriness. Yup, those were the days before digital cameras and many of my four-legged friends were captured this way. So after I wade through that huge box, I hope to add those critters to the site. In the meantime, enjoy your summer. I know I am!